As a child, Dr. Penaluna would put anatomical paper puzzles together in his room, creating an entire skeletal structure made of folded paper. So from an early age, he was extremely interested in anatomy and physiology. With an undergrad focus on psychology and kinesiology, Dr. Penaluna contemplated what health care modality he wanted to be drawn to. He considered four: medicine, naturopathic medicine, physiotherapy and chiropractic. Though he didn’t know much about it at the time, chiropractic intrigued him. When he began to look into the process of becoming a chiropractor, Dr. Penaluna was offered a contract to play professional rugby in Europe. He seized the opportunity. Unfortunately, he ended up tearing his ACL, which required a complete knee reconstruction. He also had a sizeable Baker’s cyst erupt on his left knee. Despite a few painful aspirations the cyst returned. The British Columbia native returned to Canada to rehab his knee, which he did through a Chiropractor. After his first adjustment, the cyst disappeared. He completed a month of rehab with the Chiropractor and then commenced further Sports Specific rehab with a Physiotherapist. Within a few weeks of not being adjusted, the cyst returned and remained through his second rugby contract in Europe. It was only after his contract ended and Dr. Penaluna started his Chiropractic education at Life Chiropractic College, where he was adjusted regularly, did the cyst disappear again. This experience solidified his career choice. After experiencing the remarkable effects of chiropractic and learning more about the field from his chiropractor/mentor, Dr. Penaluna applied to chiropractic schools in the United States and Canada. He was awarded a rugby scholarship to Life Chiropractic College in Marietta, Georgia. He ended up transferring to Palmer Chiropractic College in Davenport, Iowa, where he also was awarded a rugby scholarship. He liked being able to play the sport he loved while receiving his chiropractic education. Dr. Penaluna also completed a three-year course of study in Chiropractic Neurology through the Carrick Institute of Graduate Studies. He received his Diplomate, through the American Chiropractic Neurology Board in October of 2017. In addition to this specialty, he is currently acquiring his specialty in Traumatic Brain Injury Rehabilitation and Clinical Neurochemistry. Dr. Penaluna enjoys spending time with his wife and their two children: Olivia and Hayden. He also likes to hike, mountain bike, ski and play sports, particularly rugby, of course. 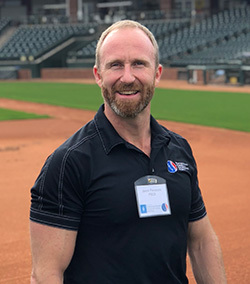 He is a Board Member of both the Probaseball Chiropractic Society and Prohockey Chiropractic Society. He is also involved in coaching local rugby clubs. Dr. Penaluna has taken care of many collegiate and professional athletes, The Seattle Seahawks, professional and international rugby players, and members of the Major League Baseball Umpires Association. Additionally, he’s collaborating on a research project with the chiropractor for the Seattle Mariners. Thrive through natural chiropractic care; contact Northwest Family Chiropractic and Massage in Shoreline today to schedule an appointment with Dr. Penaluna!